As e-learning started to become a reality in corporate organisations around the millenium, Fosway analysts firmly believed it was important for L&D to plan carefully when building e-learning solutions. E-learning should never have been about simply putting content online. 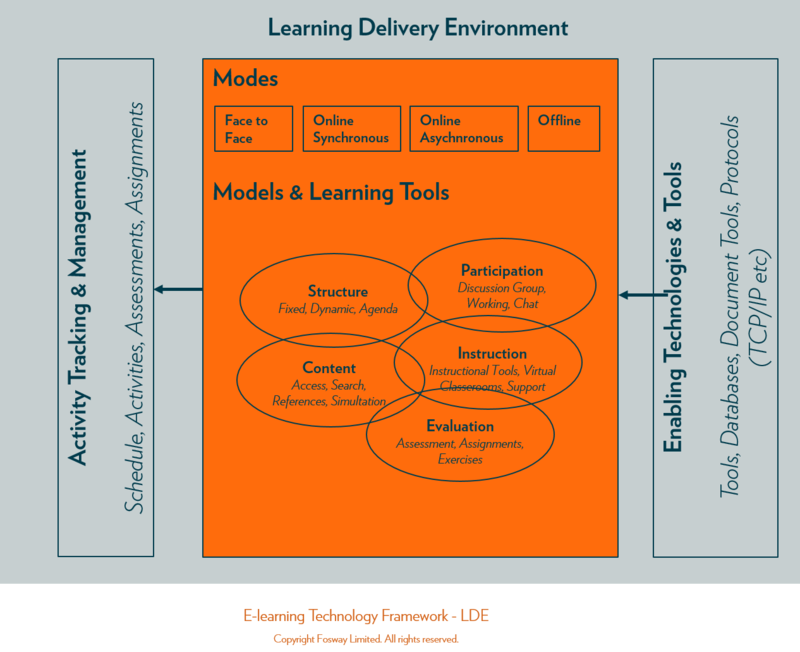 The whole architecture and correct delivery mechanisms needed to be in place to maximise the opportunity of e-learning. This paper explores how to get started with insight and guidance that remains relevant to corporate learning strategy. In the first paper in this series ‘The Future of Learning’, we discussed the primary factors to be considered when implementing e-learning solutions including learning requirements, learning models, business context and implementation approach. We will now look in more depth at the technology side of the e-learning equation. The successful implementation of an appropriate technology foundation is fundamental to any e-learning solution. However, as has already been discussed, the e-learning market place is currently very fragmented and evolving rapidly. With new products arriving, existing products being positioned as ‘e-learning’ tools, and different vendors using different terminology, you need a more objective view of the role and suitability of products against identified e-learning needs. As the e-learning market place evolves so will the understanding of the kinds of technology solution required to really support and enable e-learning. If we review what is currently available, we will find a combination of niche technology-based products and generalised content-based solutions. The niche products come in many forms, including learning management systems, collaborative learning tools, synchronous tools, assessment products, content development tools and so on. These vary hugely in terms of role, user, underlying infrastructure requirements, scalability and implementation approach. The content-based solutions are largely from ex-CBT vendors who have historically delivered CD-ROM based solutions, and who have recognised the potential of the Internet and corporate intranets as a delivery platform. These solutions are based around a pre-existing content library that is now delivered to web browsers rather than via CDs. Content is generally accessed and managed via a learning portal which increasingly provides support forums or instructional services as well as the catalogue of content. The content may be downloaded in small objects or accessed directly from the vendor’s dedicated server. A variant of the content-based solution is the custom CBT example. Historically, this would have involved development of organisational-specific content using a multimedia development tool, again often delivered via CD-ROM. In the e-learning model, this material is increasingly being delivered to web browsers and developed using extensions of the multimedia tools, plus standard web tools such as HTML and Flash. In all of the above scenarios, we need some mechanism to assess whether the proposed solutions will actually deliver real value. We also need to provide a more coherent approach to assessing technology products and to better understand their role in meeting identified learning needs. 4. Design an overall architecture or design a framework for a combination of products. At the highest level, the E-learning Technology Framework is about understanding which types of product exist, and their role in building an e-learning solution. The following diagram summarises the e-learning environment. To better understand the framework, we will now discuss each of the product types in more detail. We will then review some other critical issues including standards, scope of deployment and underlying infrastructure. The term ‘portal’ is a relatively recent addition to Internet terminology. Although definitions vary slightly between organisations, in essence a portal is an access-point to a set of services via a web-browser. A learning portal is really a concept rather than a specific product. It is an aggregation of learning services and associated products into a single (hopefully) coherent access point. Typically, this will include course catalogues, course registration, need assessment, instructional support, learner forums and so on. Whilst there are some historic examples of learning portals, most organisations have only recently started focusing on them and their potential to transform the way the learning services are delivered within a company. A recent ‘Learning Decisions’ survey from the Maisie Center, (February 2000), reports that approximately 12% of respondents are already using a learning portal, 22% building one, 32% investigating and 34% not yet on the radar screen. Portals are really a set of products to support the learning services provided. The products can range from a Learning Management System (LMS) to manage access to a course catalogue, through to collaborative tools to support discussion forums, and content tools to create and manage specific content. Access for online courses can be directly managed via the LMS component of the portal. There are two pretty distinct types of portal – internal portals and external portals. Internal portals are private, organisation-specific environments. External portals are public environments accessed by many organisations. Many of the external portals currently aggregate course schedules for the purposes of supplying a single point of booking and confirmation. They may also provide access to discussion forums and other learning management services. 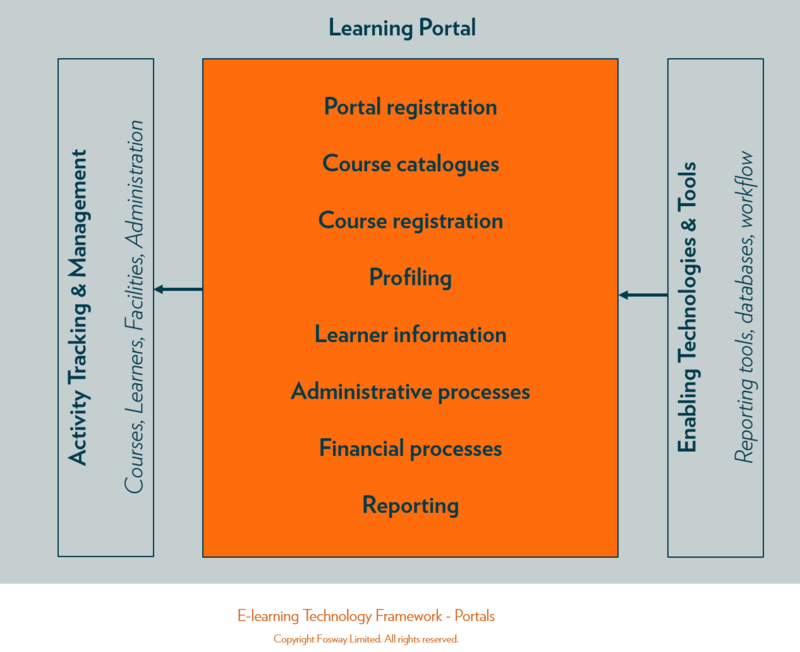 Whilst an external portal can be tailored to specific organisations, it is likely to contain a subset of total learning services needed within an organisation, or be used as a purely public learning environment. An external portal by definition cannot be closely integrated into internal HR or ERP systems. Examples of External Portal providers include THINQ, Click2Learn (formerly Asymetrix), SmartForce (formerly CBT Systems), SmartPlanet.com (formerly ZDU), Learn2.com and many more. Other related products include BlackBoard.com. An internal portal is generally available on the corporate intranet, and may provide access to the Corporate University, internal courses, forums etc. It is usually integrated with the internal Human Resources (HR) or Enterprise Resource Planning (ERP) systems. Whilst the portal may be internal, some of the courses could in fact be external, such as public courses running on the Internet. An internal portal can therefore be completely unique to a specific organisation, and is custom-developed for that organisation, often being closely integrated into other key corporate systems. The design and architecture will vary significantly based on learning service requirements, scale and underlying infrastructure. It is also possible that an internal portal could be hosted externally via an external portal provider. In this case a customised external portal is provided, including organisational-specific content in a secure environment. The external hosting probably limits the kind of private information on the portal, and limits the integration into internal systems and information. As well as now being provided via an integrated portal, learning management and administration has historically been provided by specialist tools – Learning Management Systems (LMS) or Training Management Systems (TMS). Sometimes they have also been referred to as Computer Managed Instruction, or CMI tools. An LMS developed originally for management of classroom-training will include more functionality around the management of physical training assets including classrooms, course materials, joining instructions etc. An LMS originally developed for management of CBT will include less or sometimes no functionality for managing physical facilities but include more functionality for tracking access to content and different mechanisms for launching content including web-based, network-based or CD-based content. Clearly it is important to understand primary usage requirements when selecting between these different kinds of LMS. Another significant factor will also be the scale of usage and integration. The number of courses and students, their location and access to the system all effect the kind of LMS which may be appropriate. The ultimate requirement would be for an enterprise-level application and associated data resilience in very large corporations providing company-wide access. All LMS environments require underlying databases for recording and tracking activity. The scale of access and mode of access will dictate whether these can be small local environments or high-end ‘industrial strength’ systems. User and course data also needs to be integrated into HR or ERP environments. For example, a training catalogue and registration system managed through an LMS will contain cost information which needs to be passed to internal finance systems and user information which needs to be integrated with HR systems. The LMS may also contain varying degrees of workflow functionality for managing registration and administration processes. To simplify the detailed tracking of on-line courses, standards have been developed to allow an LMS to interact with CBT or Web-Based Training (WBT) modules. These current standards are referred to as the AICC standards (developed originally by an aviation industry committee), although new and more comprehensive standards are being developed by the IMS (Instructional Management System) project. See the E-learning Standards section for more detail. The LMS is a critical component of any full-service environment or Learning Portal. The selection of an LMS requires careful consideration for an appropriate tool in terms of functionality, scalability and integration. The implementation of an LMS is typically a large project. Example vendors and products include Saba, KnowledgeSoft (now KnowledgePlanet.com), Lotus’s PathWare, and Click2Learn’s Ingenium (and historically Librarian), IntraLearn’s Icosa, PathLore, PTS Learning Systems’ PTS, John Matchett’s Registrar and Learnframe’s (ex-Pinnacle) Learning Manager. Profiling provides a different and complementary approach to determining potential learning requirements. Instead of providing a catalogue of courses and letting the individual or a management process determine requirements, profiling focuses on mapping someone’s skills against defined job roles and identifying learning needs through gap analysis. Job roles are profiled in terms of detailed skill, knowledge and experience including standard levels of competency. A person will similarly profile himself or herself with the system, identifying comparative deficiencies and proposing a learning plan which can then map onto specific courses or learning opportunities which are requested via an LMS. The benefit of profiling is that it provides a more comprehensive and less arbitrary approach to identifying learning needs. It also puts the individual more in control of determining his or her own direction and learning requirements, making it an ongoing process rather than a one-off annual review. It enables us to break down the learning delivery into smaller more flexible units, assuming the logistics of delivery allow it to be done. The downside is the work required to define and maintain meaningful role profiles, and the additional work required to map and maintain individual profiles, which can be very significant. We expect to see increasing adoption of profiling in Portals and in Learning Management Systems. Example products include Click2Learn’s Ingenium and KnowledgeSoft. One of the primary areas that differentiate portals from Learning Management Systems has been the addition of user forums and instructional services. These forums are used to provide generalised or subject specific support to individual learners, by giving them access to other students and instructors/tutors. Typically, forums are asynchronous environments (students access them at different times to each other), with text-based discussions. The instructional tools vary from asynchronous environments to synchronous tools (accessed at the same time), generally based around chat sessions. Whilst these forums clearly add some value to the learner, providing an environment for them to interact with other people, this approach to collaboration and instruction primarily reflects a CBT approach to learning. Here the student essentially learns in a self-paced mode accessing interactive learning content. The forums then provide a support environment outside the content. As we will discuss in the next section on Learning Delivery Environments, and previously in ‘The Future of Learning’ paper, this model of collaboration and instruction/facilitation is limited and, in our view, is restricted to the basic skills transfer learning model. To be really effective, collaboration, instruction and facilitation need to be tightly integrated into the learning process itself, i.e. integrated into the content, not bolted on afterwards. 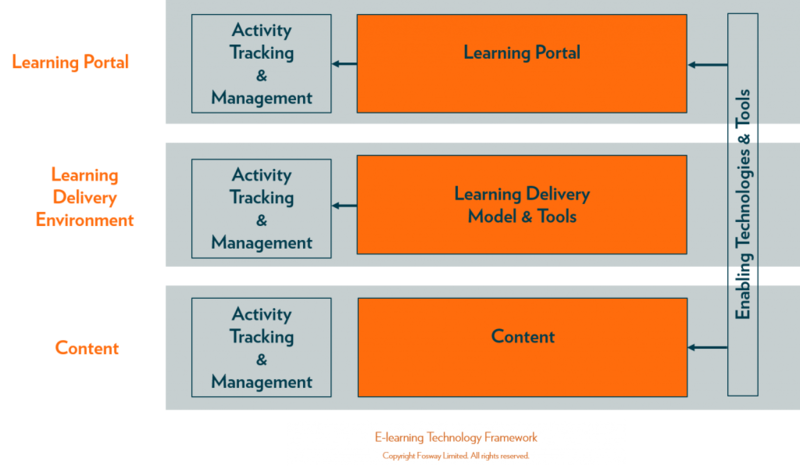 Having described portal environments for determining what learning is available, how to register or access it and the processes for managing and tracking it, we must now focus on the actual process of the learning itself. It is a common misconception that having done the above, all that is needed is to point someone to some interactive online web content and the learning will be successful. As we discussed in our previous paper, ‘The Future of E-learning’, this is very simplistic approach and is not effective for most learning requirements. Hence the most critical component of the E-learning Technology Framework is the Learning Delivery Environment, within which the actual learning takes place. This is the environment that contains and manages the learning process and integrates together the content, collaboration, instruction, facilitation, assessment and so on. Content may be of many types including documents, web references, references to physical media including books, interactive media, video, audio etc. We will discuss content types and tools in more detail in the next section. Depending on the specific learning requirements and the associated learning model, the relative mix of content, collaboration and instruction/facilitation varies enormously. (See the simplified E-learning Dynamics Matrix in ‘The Future of Learning’ paper). The role of the Learning Delivery Environment is to tightly integrate these components of learning together for the student in a transparent way. It should enable them to move between the activities of accessing detailed content, discussing it, collaborating on projects based on it, assessing it or submitting assignments or test work in a seamless way. It is important to note that it is this close integration and transparent combination of learning components that enables real learning value to be delivered. • Potential integration between learning events and personal diaries. Applying structure to the learning process and activities is sometimes more contentious than might be generally perceived. With classroom training or book-based learning we tend to adopt a fairly linear structural model. Courses are divided into modules or chapters, modules consist of a sequence of learning activities which relate to content resources, assignments, collaborative events and so on. Most LDEs allow this sequential structure to be represented directly. However, more advanced learning models including collaborative learning, coaching or project assignments, may not fit well into a simple linear structure. In these cases, we need the ability for the learning structures to be more flexible, more networked, more dynamic (defined as the course develops by the instructor/facilitator) and ultimately individual to the learner. Anyone evaluating e-learning is immediately aware of requirements for content. Content is explored in more detail in the follow-up to this paper, ‘Exploring E-learning Content’, but it is critical for the LDE to provide us with easy mechanisms to assemble and navigate any relevant content relating to the learning need. This typically includes content of many types including documents and web references as well as interactive content. In addition to accessing resources and content via the learning structure, it is also imperative that they can be accessed in more direct ways based on the learner’s or instructor/facilitator’s requirement. The methods used mainly involve a search mechanism, by text, keywords or subject area, but can include simple navigational moves. For example, a common limitation of accessing content contained in interactive/CBT style modules is the inability to jump in part way through with a “How do I …?” style of question. This is a limitation of the singular type of learning resource and the hard-coded nature of the learning paths. There are two primary ways of delivering collaboration or instructional services within a Learning Delivery Environment (or within loosely integrated forums, such as in a portal) – synchronously or asynchronously. Synchronous interaction involves the parties (students, or student and instructor) being online at the same time and communicating in real-time. This interaction can be supported by a range of synchronous communication tools including voice, chat, shared whiteboards, application sharing etc. These methods are discussed in more detail in the virtual classrooms section. The benefits of synchronous interaction are that learning and feedback are immediate and therefore happen in shortened elapsed time. The downsides are logistics and the limitation of time. Logistically delivering synchronous learning can be difficult. All parties must be on-line at the same time, regardless of location. This can work well for short sessions – maybe one-hour maximum, but is problematic for longer periods with individual attention and learning value decreasing rapidly. It is also difficult to schedule times when such sessions can happen, and therefore synchronous events tends to be relatively sparsely scheduled, often only a few times a month. Another potential consideration in synchronous communication is language. Real time interaction is most easy in your native language, and therefore it is common to find that non-native language speakers (or typists!) take on a much more passive role, with activity being dominated by native language users. These constraints need to be considered when planning the role of synchronous learning events. Asynchronous interaction involves the parties communicating over elapsed time, not real time, usually in a typewritten format. The most common examples are forums or discussion environments where topics are raised and responded to in the user’s own time, where discussion threads build up over time. As well as straightforward discussions, asynchronous interaction could also include group project activity, assessments, surveys, votes etc. These activities may be completely open-ended or may be constrained with a defined start or end time. The benefits of asynchronous interaction are its flexibility and ability to fit into everyone’s working day. You engage with the system when it suits you, and information of all kinds including documents and file attachments can be shared, not just text in discussions. The downside is that it occurs over longer elapsed times and does not support live activity. Predictably maybe, this is clear case of ‘horses for courses’, in other words, understanding the specific requirements and mapping appropriately on to the right delivery mode. It should be clear however, that in all the above discussions on synchronous versus asynchronous, the interaction is fundamental to the learning process itself, and needs to be tightly integrated into the content and other tools being used. Subject content is intimate to the interaction vehicle and we should move transparently between content, structure and collaborative tools in order to provide immediate context for associated discussions and collaborative activities. advanced learning requirements such as management development. Assessment is a complex area in its own right and a detailed discussion is outside the scope of this document. Assessment tools may be a component of the LDE or be specialist assessment tools that are integrated into the LDE. An example of a specialist assessment tool is QuestionMark Perception. Whilst information relating to the learner will also be stored within any controlling Learning Management System, learner details are required within the learning process, and therefore the LDE. Any environment allowing collaboration or instructional interaction needs some basic information about the learner to be available to the other parties. This is commonly achieved through the use of a personal profile form. The contents of this form will vary from environment to environment but should include basic public domain information on the student, such as an e-mail address, and may include additional information including a photograph or pointers to other information sources. Note: different countries and organisations will have different rules regarding what information can legally be made available in this way. These rules may have significant implications on a multi-geography student population such as one attending an Internet-based e-learning course. As well as basic information on the learner, the LDE will need to keep more private information regarding the learner’s progress and results through the learning process. This could include information on what has been completed, test results, assignment grades etc. This detailed tracking information could also include information accessed via AICC or IMS related standards for integration with interactive content. Again there will be legislative requirements which may need to be complied with regarding how the learner, the instructor/facilitator or the learning provider can access this information. We would typically expect a subset of this detailed information to be passed back to the Portal or Learning Management System for permanent recording on completion of the course. Example Learning Delivery Environments of varying functionality include Lotus LearningSpace (Forum,Anytime), IntraLearn, Blackboard.com, many academic systems including TopClass, FirstClass, WebCT. These tools can be particularly effective for short-timescale information transfer requirements, or to support other asynchronous learning processes or for regular scheduled update sessions. The degree of interactivity within an actual live session is controlled by the instructor and will be more limited for larger audience sizes as the interaction processes become harder to manage. Also the performance of the products depends on the size of audience as well as the media being transmitted. It is important to consider bandwidth issues when designing content for use across this medium. Example virtual classroom products include Centra Symposium, InterWise Millenium, Ilinc. Another leading product, Databeam’s LearningServer was acquired by Lotus in 1998. This technology then formed the basis of Lotus Sametime and underpins LearningSpace Anytime 3.0 and the forthcoming LearningSpace 4.0 (“Athena”). The classroom can also play an important part in an integrated e-learning programme. Such sessions can make use of equipment or services that may not be available electronically. They can be used as an introductory session for an e-learning programme, where electronic access can be tried, and key issues can be aired and resolved quickly. Introductory classroom sessions also allow the participants to build a sense of ‘community’, so that they feel more comfortable about participating on-line. Face-to-face sessions in the middle of a programme give the learners a goal on which to focus, ensuring work is completed on time. They can be used for rapid decision-making activities, team exercises and meetings, and to exploit opportunities to meet with people outside the e-learning programme. The key to using face-to-face learning sessions is ensuring that the timetable is consciously designed around activities that are appropriate for that situation. It may be very expensive to bring the participants together, and other alternatives should be used unless there is a genuine reason why face-to-face is the answer. • Web-enabled electronic performance support systems to use this capital more productively. The future of learning content itself is discussed in the third and final paper in this series, ‘Exploring E-learning Content’. To talk to us about our research on learning and talent systems, or to discuss what it might specifically mean for your organisation please contact us directly. We will use our independent expertise to provide you with the guidance you need to accelerate and de-risk your decisions. We have a wealth of experience, tools, research and profiles at our disposal. We don’t have any products to sell and we have no vested interest to bias your outcomes. We concentrate on pragmatic, independent advice. The analysis and recommendations made in this document are based on the information currently available to Fosway and from sources believed to be reliable. Fosway disclaims all warranties as to the accuracy, completeness or adequacy of such information. Fosway will have no liability for errors, omissions or inadequacies in the information contained herein or for interpretations hereof. Opinions expressed herein are subject to change without notice. All content is copyright Fosway limited unless otherwise identified. All rights reserved. At Fosway Group, we understand that developing and engaging people is how complex global organisations deliver performance and achieve success. Just as every employee’s talent journey is unique, so is every organisation’s people strategy. Fosway Group’s analyst and advisory services deliver the insights your organisation needs to achieve results and eliminate risk. We know that every aspect of next generation HR and talent are more intertwined than ever. When you work with us, you accelerate your insight and make better decisions. We’re Europe’s #1 independent HR analyst, and just like the Roman road we draw our name from, you’ll find that we’re unusually direct. We don’t have a vested interest in your technology or consulting choices. You can depend on us to tell you what you need to know to succeed. Example clients include: Alstom, Aviva, Boots UK, BP, BT, Centrica, Deutsche Bank, Faurecia, HSBC, International SOS, Lloyds Banking Group, Novartis, PwC, Rolls-Royce, Royal Bank of Scotland, Sanofi, Shell, Swiss Re, Telefonica, Thomson Reuters, Toyota Europe, and Vodafone. Talk to our analyst team today about your talent management requirements and get insights into your procurement process and strategic decision making. Contact us online or call +44 (0)20 7917 1870 or email info@fosway.com.